A craton (kratos; Greek for strength) is an old and stable part of the continental crust that has survived the merging and splitting of continents and supercontinents for at least 500 million years. Some are over 2 billion years old. Cratons are generally found in the interiors of continents and are characteristically composed of ancient crystalline basement crust of lightweight felsic igneous rock such as granite. They have a thick crust and deep roots that extend into the mantle beneath to depths of 200 km. The term craton is used to distinguish the stable interior portion of the continental crust from such regions as mobile geosynclinal troughs, which are linear belts of sediment accumulations subject to subsidence, or downwarping. The extensive central cratons of continents may consist of both shields and platforms, and the crystalline basement. A shield is that part of a craton in which the usually Precambrian basement rocks crop out extensively at the surface. In contrast, the platform of the basement is overlain by horizontal or subhorizontal sediments. Cratons are subdivided geographically into geologic provinces. A geologic province is a spatial entity with common geologic attributes. A province may include a single dominant structural element such as a basin or a fold belt, or a number of contiguous related elements. Adjoining provinces may be similar in structure but be considered separate due to differing histories. There are several meanings of geologic provinces, as used in specific contexts. Continental cratons have deep roots that extend down into the mantle. Mantle tomography shows that cratons are underlain by anomalously cold mantle corresponding to lithosphere more than twice the approximately 60 mile (100 km) thickness of mature oceanic or noncratonic continental lithosphere. Thus at that depth, it could be argued that some cratons might even be anchored in the asthenosphere. Mantle roots must be chemically distinct because cratons have a neutral or positive buoyancy, and a low intrinsic density that is required to offset any density increases due to geothermal contraction. Rock samples of mantle roots contain peridotites, and have been delivered to the surface as inclusions in diamond-bearing subvolcanic pipes called kimberlite pipes. These inclusions have densities consistent with craton composition and are composed of mantle material residual from high degrees of partial melt. Peridotites are important for understanding the deep composition and origin of cratons because peridotite nodules are pieces of mantle rock modified by partial melting. Harzburgite peridotites represent the crystalline residues after extraction of melts of compositions like basalt and komatiite. Alpine peridotites are slabs of uppermost mantle, many from oceanic lithosphere, also residues after extraction of partial melt, but they were subsequently emplaced together with oceanic crust along thrust faults up into the Alpine mountain belts. An associated class of inclusions called eclogites, consists of rocks corresponding compositionally to oceanic crust ( basalt), but that metamorphosed under deep mantle conditions. Isotopic studies reveal that many eclogite inclusions are samples of ancient oceanic crust subducted billions of years ago to depths exceeding 90 mi (150 km) into the deep kimberlite diamond areas. They remained fixed there within the drifting tectonic plates until carried to the surface by deep-rooted magmatic eruptions. If peridotite and eclogite inclusions are of the same temporal origin, then peridotite must have also originated from sea-floor spreading ridges billions of years ago, or from mantle affected by subduction of oceanic crust then. During the early begins, when the Earth was much hotter, greater degrees of melting at oceanic spreading ridges generated oceanic lithosphere with thick crust, much thicker than 12 miles (20 km), and a highly depleted mantle. Such a lithosphere would not sink deeply or subduct because of its buoyancy, and because of the removal of denser melt that in turn lowered the density of the residual mantle. Accordingly, cratonic mantle roots are probably composed of buoyantly subducted slabs of a highly depleted oceanic lithosphere. These deep mantle roots increase the stability, anchoring and survivability of cratons and makes them much less susceptible to tectonic thickening by collisions, or destruction by sediment subduction. The word craton was first proposed by the German geologist L. Kober in 1921 as "Kratogen," referring to stable continental platforms, and "orogen" as a term for mountain or orogenic belts. Later authors shortened the former term to kraton and then to craton. The process by which cratons are formed from early rock is called cratonization. The first large cratonic landmasses formed during the Archean eon. During the Early Archean the Earth's heat flow was nearly three times higher than it is today because of the greater concentration of radioactive isotopes and the residual heat from the Earth's accretion. Tectonic and volcanic activity were considerably more active than they are today; the mantle was much more fluid and the crust much thinner. This resulted in rapid formation of oceanic crust at ridges and hot spots, and rapid recycling of oceanic crust at subduction zones. The Earth's surface was probably broken up into many small plates with volcanic islands and arcs in great abundance. Small protocontinents (cratons) formed as crustal rock was melted and remelted by hot spots and recycled in subduction zones. There were no large continents in the Early Archean, and small protocontinents were probably the norm in the Mesoarchean because they were probably prevented from coalescing into larger units by the high rate of geologic activity. These felsic protocontinents (cratons) probably formed at hot spots from a variety of sources: mafic magma melting more felsic rocks, partial melting of mafic rock, and from the metamorphic alteration of felsic sedimentary rocks. 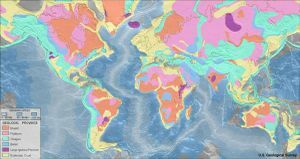 Although the first continents formed during the Archean, rock of this age makes up only 7% of the world's current cratons; even allowing for erosion and destruction of past formations, evidence suggests that only 5-40% of the present continental crust formed during the Archean. (Stanley, 1999). "Very thick sections of mostly submarine mafic, and subordinate ultramafic, volcanic rocks, and mostly younger subaerial and submarine felsic volcanic rocks and sediments were oppressed into complex synforms between rising young domiform felsic batholiths mobilized by hydrous partial melting in the lower crust. Upper-crust granite-and-greenstone terrains underwent moderate regional shortening, decoupled from the lower crust, during compositional inversion accompanying doming, but cratonization soon followed. Tonalitic basement is preserved beneath some greenstone sections but supracrustal rocks commonly give way downward to correlative or younger plutonic rocks... Mantle plumes probably did not yet exist, and developing continents were concentrated in cool regions. Hot-region upper mantle was partly molten, and voluminous magmas, mostly ultramafic, erupted through many ephemeral submarine vents and rifts focussed at the thinnest crust.... Surviving Archean crust is from regions of cooler, and more depleted, mantle, wherein greater stability permitted uncommonly thick volcanic accumulations from which voluminous partial-melt, low-density felsic rocks could be generated."